Roth IRA or Traditional IRA – Which is Right for You? An IRA is an Individual Retirement Account. The benefits are similar to a 401k but I won’t be talking about a 401k today. My recommendation is usually to have both though. Many have heard of and/or are using this vehicle already to facilitate their retirement goals. However, there are two types that can mean drastic differences to your retirement savings. You can begin withdrawals without penalty after 5 years if you reach age 59 1/2 or meet other qualifying conditions. The main difference is the tax advantages. If you contribute to a traditional Roth, you can deduct your contributions pre-tax, meaning you won’t pay any taxes on that earned income that year. However, with a Roth IRA, your contributions are made after taxes. 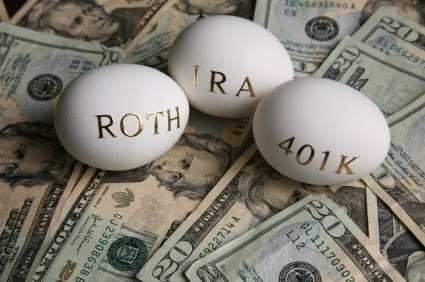 There is no immediate tax benefit with a Roth, however you pay no taxes when you take your withdrawals in retirement. If you believe that the tax rate applicable to your withdrawals at retirement will be more than they were when you contributed, then a Roth IRA might be for you. Assume you purchased $5500 worth of KO and in 20 years those shares are now worth over $20,000 (A 7% annualized gain would give you $21,283.26). Well if you held this money in a Roth IRA, you wouldn’t pay any taxes on these gains. If you held the stock in a traditional IRA, you’d owe taxes on over $14,500 of capital gains and dividends. Let’s assume you have $5500 pretax to be able to put into a Roth or Traditional each year. Well you can either contribute this full $5500 to a traditional IRA or after taxes (assuming 25%) , you will have $4,125.00 yearly to invest in a Roth. Here’s a look at the growth of your accounts for 20 years assuming a 7% simple annual interest rate and contributions at the end of each year. Let’s say you want to start taking distribution after the 20 years are up. Well you owe taxes on the entire amount in your Traditional IRA so you pay taxes with each distribution. Without further growth you’d owe $56,368.80. If you subtract this from $225,475.21 then you have exactly $169,106.41, which is the same as the value in your Roth. So if you started in a 25% bracket and end up still in your 25% bracket then your earnings are pretty much the same. Will saving taxes today be worth less than savings taxes on a larger amount in the future? It really depends on your timeline and estimated tax brackets. If you have 30 years until retirement, that’s a lot of time for your investments to compound and grow. If you have a shorter timeline to retirement then you don’t have nearly as much time for compounding to work its magic. It can be very difficult to estimate your tax bracket in retirement. Between your income level and the government changing the rules, anything could happen in the future. If you are in a smaller tax bracket at retirement then you might be better off with a traditional IRA. Conversely, if you are in a larger tax bracket at retirement then you would probably be better off in a Roth IRA. Regardless of your tax brackets, my recommendation is to start saving and start investing for your future now! Personally, I don’t meet the income levels but I’d probably be contributing to a Roth if I did. You can find a lot of additional information on the IRS website here. Thanks. I think you are doing it right then. I actually didn’t know you could take out early principal contributions from your Roth tax free until I started reading that IRS link. I think that’s a great plan. You can let these retirement plans grow to supplement more income once you hit that 59 1/2 mark. As you mention, it will be like a bonus since you’ll be used to a lower income previous to that if you are retiring by 45. Even though you don’t meet the incomes levels you can still do a “back door” ROTH. I never knew about a “non” deductible traditional IRA. Thanks for the info. I’ll have to look into it and how I could convert it to a Roth to see if it’s worth the efforts. I as well take advantage of this method to get money into a ROTH. I think it is just as important to be diversified across taxation as it is in investments. Basically I have a friend that converts money in an account for me over to the ROTH. Even though you don’t meet income requirements it is possible. I probably will continue to do so until they change the rules. Personally I have a ROTH IRA. Most likely it would be better for me to have a traditional IRA to reduce my tax basis now and then hopefully bump into the 15% tax bracket during early retirement. However, I’m worried that A) Tax rates might get raised B) I might not live as frugally at 59.5 as I do now although this would still make traditional a better option because I would be in the same (probably) tax bracket. But, if I contribute to my ROTH IRA for the next 15 years or so I’ll have a 4 year buffer of expenses (at least) in tax-free withrawable contributions if needed. Really, I think I have TOO many safety nets right now. 401K, maxed ROTH IRA and a taxable account. If I dumped everything into my taxable account I could be retired sooner. You make some good points and nobody knows what the future of our tax system may be. I do know it’s been higher before so there’s definitely a chance of increasing taxes especially with our ballooning debt. The ability to take out your contributions tax-free form a Roth would be a huge plus for me if I had one. We have to balance a little risk for some safety. I think you are doing the right thing. I’m actually planning to start maxing out my 401-k now that I’m hitting some high tax brackets. It will certainly be a nice bonus once we hit 59 1/2. Thanks for stopping by with your feedback. It answered every single one of my questions, including those that I should have had! Excellent read. Thanks for that link. I’ll have to check it out.